Most people relish the idea of going away as it’s a brief respite from the daily grind. For me, this includes the minutiae of weekly meal planning: the search for inspiration, then the preparation, cooking and cleaning. Even though Chef Savla does most of the culinary heavy lifting (in my defence, I do breakfasts and weekday lunches), why would we seek out a similar routine on holiday? Because we wanted to do something different in Lisbon. Eating and drinking around as we did in San Sebastián was still very much on the schedule, but change is good. Also, if we didn’t like it, it was only five hours out of our week. 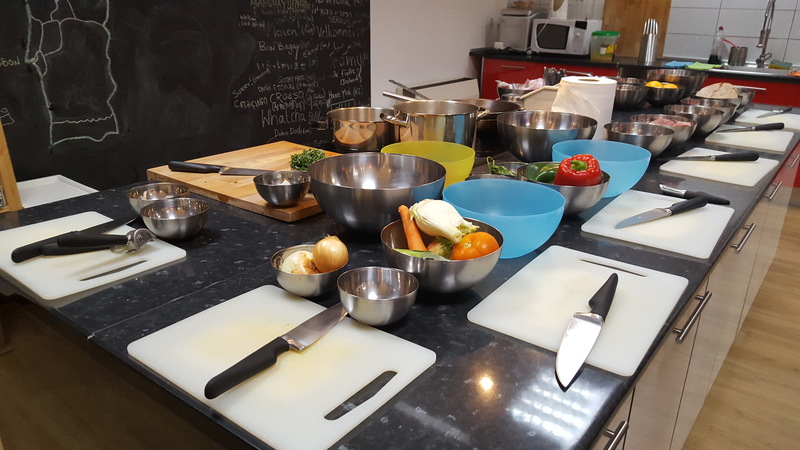 We chose Cooking Lisbon as they’re one of the few companies to offer a market tour and traditional cookery course. Whenever I’m shopping for food, I love roaming the aisles to see what’s new, plotting what I’d do with the produce and losing myself in reverie. This behaviour cranks up a notch when travelling: shelves are stacked high with unknown tins, boxes and tubs; fresh produce is an exciting riot of shades, shapes and smells; and the layout and signage is unfamiliar. The market we visited wasn’t a total stranger, however. 5th October being a national holiday in Portugal, the local ones were closed, so after the introductions (8 participants in total), we set off for the Time Out Market. Having tucked into a few plates from the food stalls some days beforehand, we knew about the restaurants, but hadn’t experienced the market itself. Our teacher Maria (a former professional chef) bases the day’s menu on what’s available and in season. Following a straw poll, squid and pork came out on top, both of which were promptly purchased, along with cornbread and the vegetable accompaniments. As we weaved our way through the aisles, I spotted the blackbelly rosefish we’d had for dinner at seafood mecca Sea Me, snapped up a couple of packets of almond biscuits as gifts and got distracted by the colours and contours of local vegetables; I love markets. Back in class, we got to know each a bit while nibbling on cornbread chunks dipped in three different olive oils and balsamic, salty lupini beans (bite first, squeeze the bean out of the skin and throw it away) and wine. In our group, we had a pair of retired friends from Canada who were touring Portugal and two young British couples celebrating a birthday; a nice mix of ages and interests. As I’d expected Maria to give us a demo before we replicated the dishes at our own stations, I was surprised to see cooking paraphernalia around a single large island. A specific task was delegated to each person, e.g. chopping onions or preparing the squid, and the plan was to cook together. Maria got us started then we got stuck in. It felt like being in a hilarious episode of Ready Steady Cook as one of the guys had student-level skills in the kitchen, which his friend gleefully pointed out. Our two savoury dishes were squid risotto and migas. The latter is a Portuguese staple made using leftover bread, or potatoes in the southern Alentejo region. Our version featured pork, and it’s interesting to note that the Spaniards sometimes add chorizo and bacon, while the Mexicans prefer beef. Originally eaten at breakfast, migas is now enjoyed at lunch and dinner. Both dishes took little time to rustle up and were hearty meals. Despite resembling lumpy beige mush when plated, the powerfully comforting combination of garlic, breadcrumbs, cabbage and cowpeas in the migas was a winner for me (we overcooked the squid a touch). Dessert was an orange roll, which was basically eggs, sugar, flour and orange zest. The rubbery texture may not work for some, but I was as happy as Larry. Bellies about to burst, we said our goodbyes and walked to the Tile Museum to aid digestion. Over the next day or two, we bumped into our British buddies again and swapped more travel tips, making us feel at home in Lisbon. 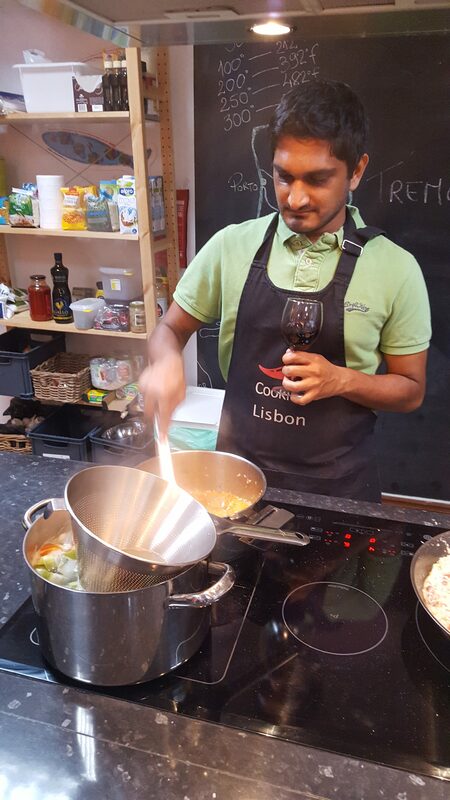 Joining Cooking Lisbon was such a fun experience, and a good opportunity to learn about Portuguese cuisine through practice. You can also make the much-adored pasteís de nata, which we didn’t book this time. We did, however, make up for our mistake by eating at least 2-3 fresh ones daily; it’d rude not to. Budget: €85pp, including all food and wine. The Market Tour takes place from 9:30am on Thursdays and Saturdays throughout the year, with an estimated end time of 2:30pm. All words and images are my own, unless otherwise stated, and remain the property of www.savlafaire.com. More photos on my Instagram here. I love cookery classes! And must’ve been great cooking up some local food. I remember that migas dish from Nuno Mendes’ masterclass we went to. And of course you can’t go wrong with pasteis de nata.. or four. Nuno’s dish was incredible, especially for garlic lovers! 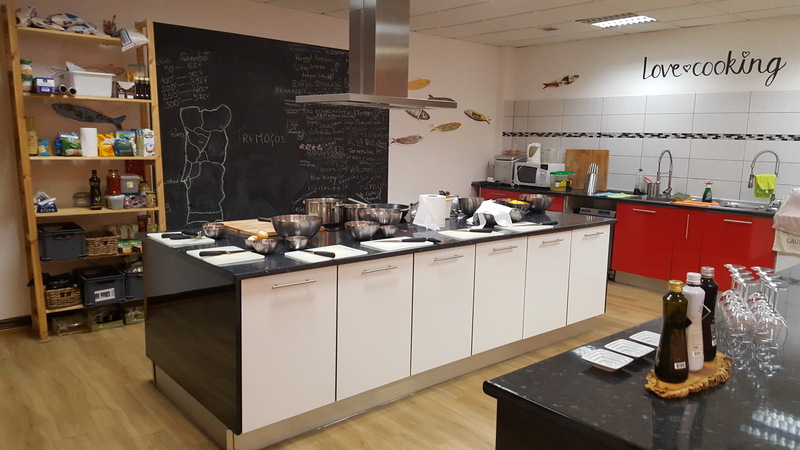 I’ll definitely be checking out more cookery classes when I travel, and am sure I’ll manage to fit in a sweet one next time. Sounds fabulous! I’ve done lots of food tours now but am yet to do a market tour and cooking class combo… though I’m hoping to rectify that in Sri Lanka! I loved our long weekend in Lisbon and this had made me want to go right back now!